Similar to the other card from Southborough this one is dated earlier the same year, carrying the postmark ‘TUNBRIDGE WELLS 6.45pm 15 JAN 1981 KENT’ together with the detailed Pantiles postmark. 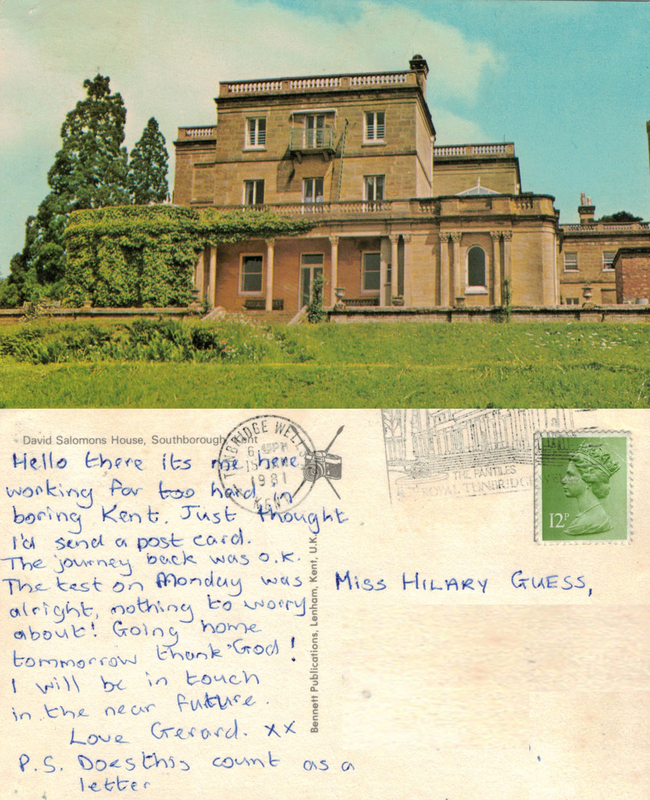 This card again features David Salomon‘s house, which in the 1980’s was a regional conference and training centre. This entry was posted in autobiography, Journies, Life Path, Nostalgia, People, Postcards, Romance, Travel and tagged friends, Kent, love, postcards, romance, Royal Tunbridge Wells, teenage, teenagers. Bookmark the permalink. I’ve been doing a bit of clearing out and coming across some letters. It’s always interesting how they take you back. I used to have a friend who didn’t have phone. We always arranged visits by mail, down to the fine detail sometimes. We lost touch a few years ago; her decision. I still think about her, and miss the times we had. I only have inklings of why she wanted to cut me out of her life, and of course, it still hurts. And this wasn’t so many years ago either! My friend lived in a high rise block of flats, there was one phone box for everyone. Actually, this has just reminded me of the letters I found that my Dad wrote to my Mum when they were courting. They arranged their dates by letter.